Development Phase - Letter from African slave sent from America to a family member back home in Africa Set the scene Although Slavery existed before the nineteenth Centaury, people find it particularly shocking that such barbaric methods were in effect in the modern ages. Thousands of people were taken from their homes. Some had been slaves in Africa but most had been born free. They had come from many different African cultures. Some were highly skilled as leaders, weavers, sculptors, metal smiths, and storytellers. Most had been either kidnapped or captured in raids on villages and duped in believing romantic notions of a better life. They were led onto ships, where they lost their freedom and were labelled nothing more than - slave. 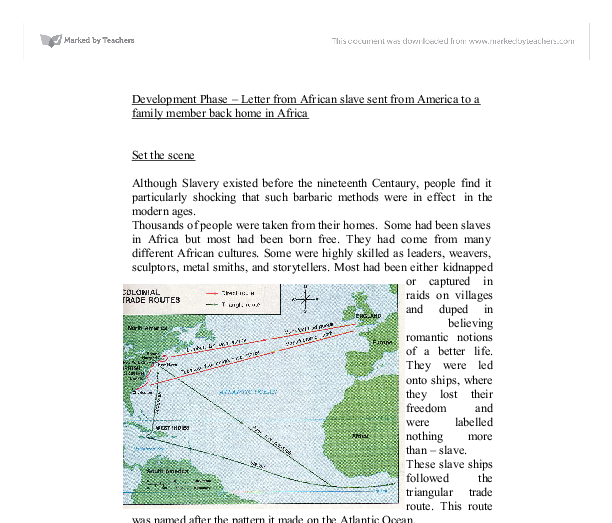 These slave ships followed the triangular trade route. This route was named after the pattern it made on the Atlantic Ocean. 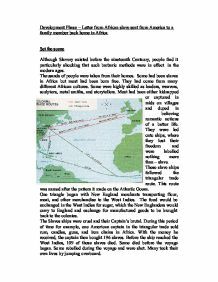 One triangle began with New England merchants transporting flour, meat, and other merchandise to the West Indies. The food would be exchanged in the West Indies for sugar, which the New Englanders would carry to England and exchange for manufactured goods to be brought back to the colonies. ...read more. I wish to [k]now what has Ever become of my Presus little girl. I left her in goldsborough with Mr. Walker and I have not herd from her Since and Walker Said that he was going to Carry her to Rockingham and gave her to his Sister and I want to [k]no[w] whether he did or no as I do wish to See her very mutch and Boss Says he wishes to [k]now whether he will Sell her or now and the least that can buy her and that he wishes a answer as Soon as he can get one as I wis himto buy her an my Boss being a man of Reason and fealing wishes to grant my trubled breast that mutch gratification and wishes to [k]now whether he will Sell her now. So I must come to a close by Escribing my Self you long loved and well wishing play mate as a Servant until death Vilet Lester of Georgia to Miss Patsey Padison of North Caroliner My Bosses Name is James B Lester and if you Should think a nuff of me to right me which I do beg the faver of you as a Sevant direct your letter to Millray Bullock County Georgia. ...read more. I hav noo cloths and shoos. She is keen to tell her mother of her new and wonderful life because she is proud of it. I am not angry with you becos you didn't help me and helpd mi sister. Jo told me huow it werks. Another reason that she is keen to share her new life with her mother is out of spite, as her mother helped her sister escape but not her. She makes a reference to her owner, Joe, this alienates herself from her mother by idolising someone else. I miss you and him but I am happy he has left me and you and that he has gone. This makes a reference to her father, it implies that she did not like him and shows that although she misses him he must have caused her and her mother great worry. The ladi says I must go. Goodbye love your dorta. This end bittersweet because the person reading the letter doesn't know whether all of the things said were true or whether they were a fabrication of the truth. Does the lay want her to go and work as a slave? Or does she want to show her how to sew more tapestry pieces? [wx1]She first tells her mother that she is happy, so that her won't worry ...read more. The Civil Rights Act of 1964 banned discrimination on the grounds of gender. In 1966 the National Organisation for Women was set up. By 1970 it had 40,000 members. In 1972 the Educational Amendment Act banned all forms of gender discrimination in education including in school books. Colonial officials began imposing European law in the 19th century throughout the continent of Africa. The more laborers they were impacted on how much land were needed that the family could marshal to work the land. To increase the production, a family needed to invest in more laborers and thus increase their share of land. Sadly after a time the old king died. Picture 6: After the kings death the queen said to Prince Bharat, " The old king is dead now and Rama is not here therefore you can be the brand new king." Some religions believed in strict belief in the bible others, and some separated off an believed in more of a family community. One example of the church is a large part of the community is the Salem witch trials in which we saw a movie and read a paper on it. Why Things Were the Way They Were. The mentality of most slave owners was that slaves were inferior human beings who were not privileged to look a white man in the eye. This woman, being from the city and having a more respectful mentality towards slaves, thought otherwise. What lay behind the horrors of the slave trade. The workers roll the barrel of sugar to the weighing scales. The weighing scales are there to show how much sugar there is in the bags boxes and barrels. However on the other hand people who worked indirectly or beyond the plantation were slaves whom delt with the sugar in the refinery. Thankfully, I had imagined that this would be the case as I was packing and thus decided it would be necessary to only bring a pen to write this letter, our last picture we took together as we walked in the snow to Christmas eve mass, and documentations of my farming experience.